GoPro cameras are the best way to capture crystal-clear photos and videos when using a drone. They are the best line of action cameras released to date, able to be mounted on drones to capture every moment. GoPros are the perfect addition to a compatible drone because they are typically better than any onboard camera. One key trait of the GoPro camera series is that they were designed to be in tow, and attached to devices such as drones. We wanted to provide a thorough list of the best drone with gopro options, so you can make your choice with a bit of background information as a base for for you to refer to. Once you get equipped with a drone and use it in conjunction with a gopro, you’ll be pulling down awesome action shots within no time. Why a GoPro when there are other action cameras available? GoPro was faced with the task of stepping their game up after the decision was made to scrap the drone idea and go with action cameras completely again. The GoPro HERO6 Black and the GoPro Fusion are reminders of why they stand out and where their best work is. These additions to their lineup, especially when you look at the HERO line, are reminders of why they are the best of the best where action cameras are concerned. You can, and the best plan of action is to choose a drone that is compatible with GoPro technology, such as the DJI Phantom 2, or other standout products in the Yuneec and Blade product lines. When a drone features extra mounts, you can be sure that it will require less difficult setup and tinkering. The GoPro camera series can thrive with nearly any drone that is set up with a 3-axis gimbal. Some drones such as the Dji Phantom 2 and GoPro’s own Karma release are specifically made to house the drone well, but others from manufacturers such as Hubsan and Syma are not. You can look up many ways to modify drones to make sure a GoPro will fit as a camera device, but the drones you will not have luck with are the minis. Some of the palm-sized drones and smaller will simply not carry the payload of a GoPro. If you select a drone that is already gopro compatible, then you’ll have the reassurance that mounting it and getting aerial footage won’t be an added difficulty. What are the benefits of the “Karma Grip” product? This is an image stabilization and usability product: it is a stick with a gimbal on the end that helps create a much smoother image. Using the grip gives you full control of the GoPro, which is one of the hugest assets in the industry for taking videos while moving. You can attach the gimbal to separate GoPro mounts, making a it much easier for those on bikes, snowboards, and skis the grab great footage. Which is the newest GoPro camera? The newest action camera from GoPro is the GoPro Fusion. It’s a dual-camera GoPro that’s capable of 360-degree audio, both VR and non-VR, and has 5.2K resolution with a rate of 30 FPS. However, if you’re looking for one of the newest models with an abundance of features, you’ll want to go with the GoPro HERO6 Black. It has double the features and is much better than the previous version, the GoPro HERO5 Black. 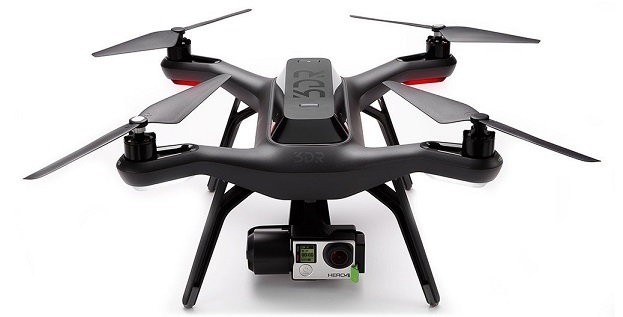 Can I use a GoPro with the Parrot AR Drone 2.0 Quadricopter? 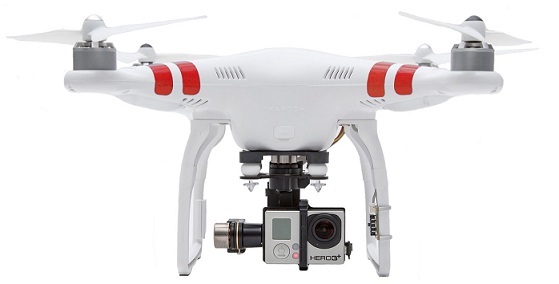 This is a popular drone that many choose to document their local landscape from above. It comes with a 720p HD live-video streaming camera, but you may want the flexibility and accuracy of a GoPro camera. You just need a mount or gimbal device to make sure that you are able use any cameras from the GoPro series with a Parrot drone. Because GoPros are relatively small in size, their weights are ranged but generally small, as well. For example, the GoPro HERO4 Black weighs 88g without the housing. With the housing, it weighs 152g. GoPros, thankfully, aren’t extremely expensive. For example, you can get the GoPro HERO6 Black for only $400. The HERO5 Black is a little cheaper than that, as well, coming in at only $300. It’s safe to say that there are a number of price ranges and GoPro lines out there for every budget. GoPro cameras are also made for durability. The GoPro HERO4, for example, is waterproof in up to 33ft of water. You won’t have to worry about a GoPro being totaled should your drone crash if you have it in its housing, too. It wasn’t too long ago that GoPro had begun to focus on their own line of drones, the Karma, but we’ve seen them scale back that idea. They’ve decided to stick to furthering their line of action cameras, instead. They’ve gone back to what has made GoPro cameras so popular – great cameras and the best resolutions available. The GoPro Fusion is the latest and greatest GoPro on the market. They have also released a new member of the HERO family, the HERO6 Black. 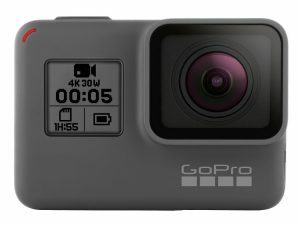 The Fusion is currently priced at $700, while the HERO6 Black is priced at $500. 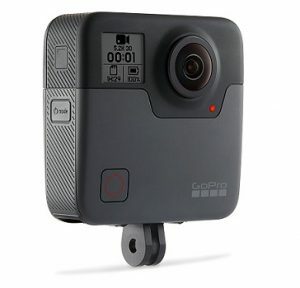 The GoPro HERO6 Black was released back in September of 2017. It boasts a faster WiFi transfer than any of the previous action cameras from the HERO line. The major upgrade that should be noted is the fact that it comes with the GP1 custom processor, which allows for additional frame rate options and higher resolution when you compare it to the HERO5 Black. It boasts 4K at 60 FPS, 2.7K at 120 FPS, and 1080p at 240 FPS. The HERO6 Black also offers slow-motion video playback, better low-light performance, and a more dynamic range when compared to the HERO5 Black. It is, however, quite expensive, coming in at $500. Because it has more features than the other cameras from the HERO line, the battery life isn’t as long as we’d like it to be. You should expect an average battery life of around 1 hour and 30 minutes, but the battery will be drained a lot faster when using slow-motion playback and shooting in 4K. e camera of its kind. It’s a 2-camera design that’s incredible when you look into the specs. It captures both VR and non-VR, has 360-degree audio, and boasts 5.2K resolution at 30 FPS. It also works with most existing GoPro mounts, so it’s not difficult to find something that will work for both you and your drone. Unfortunately, because it has the two cameras, you’ll need to have two microSD cards. It’s also only waterproof up to 5m, which isn’t all that bad, but quality does suffer underwater, in general. This is the top-of-the-line GoPro camera device that definitely helped boost the GoPro name back to the top of the camera pack. It is the one you want to document your adventures in 4K video, and also takes 12MP photos in Single, Burst, and Time Lapse modes. You can playback and view your shots right on the spot with a 2” monitor, and voice control as well as one-button simplicity are some of the reasons why it ranks so high on the drone camera GoPro list. You can use the Quick GoPro editing app to piece together footage in the way you had envisioned the finished product, and it weighs just around 4.2 ounces. Absolutely at the top of the list as far as their extensive product line, this is the device you want to bring a GoPro quadcopter all of the way to life. Here are some stats on this cool camera, to help you finalize your decision about a HERO 5 Black purchase. Equipping a drone with GoPro just got better with the release of the GoPro HERO5 Session: situated just one notch under the HERO5 Black, you still enjoy the rugged design and many features of this product line. It is waterproof to 33 ft without a housing, and with a single press of the shutter button, you can power the camera off and on, as well as begin recording. You also still get the voice control feature, where you can enjoy hands-free control of your GoPro just by using simple commands. The 10MP photos are just the slightest notch of quality under what the HERO5 Black offers, and you’ll love having this one with you at the skatepark, mountainside, stunt show, or dirt track. The GoPro Smart Remote is a unique drone camera GoPro tool that gives the user full remote control of camera functions such as shutter, power, the tag button, sharing, and editing. 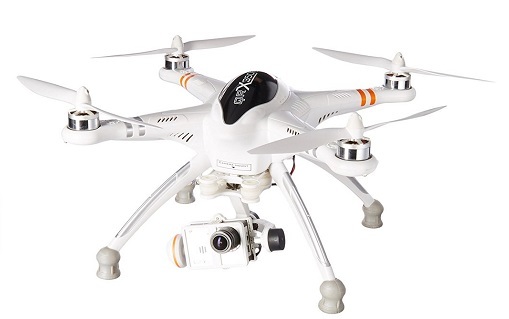 It works at distances of up to 600 feet, and can even control up to 50 GoPro units at a time. There is 40% more battery capacity here then in the regular WiFI remote, and this incredibly handy device can be work or mounted to your gear for lightening-fast access. It also has the benefit of being waterproof, and is the perfect accessory to put to use with a cheap GoPro drone. The further away you get from your subject, the more useful a tool like this becomes: here are some specs on this handy remote to give you the information you need before deciding to purchase. Get super fast and free shipping when you order the Blackhawk from AltairAerial.com, or you can also see Best Price at Amazon. The Blackhawk is a more advanced level quad with 15-17 Minutes of Flight time and 300-500 Meter Range! The Blackhawk by Altair Aerial costs around $120 and is the best drone with GoPro mount if you want a more budget-friendly, GoPro-compatible drone. It’s a great drone for those at an advanced level of drone flying. You won’t find a faster drone that’s capable of tricks and flips within this price range. Even though it’s the cheapest drone for GoPro, it feels like a heavy-duty drone that weighs approximately 1.07 pounds. Because it has brushless motors, which make the drone quieter with stable flights, it’s perfect for a GoPro. It’s compatible with GoPro models HERO3 and HERO4, which are two of the best cameras from the HERO line, overall. Not only that, but the customer service from Altair Aerial is sublime. They are a small, Nebraska-based company from the US, which means they have the time to deal with every issue on a personal basis. This is not something that can usually be expected from drone manufacturers, so that’s an added bonus. • 360 degree flip mode lets you do crazy stunts – capturing video the whole time! This is an excellent GoPro drone, designed with an incredibly fluid video-game style controller, designed to make the pilot have a sense of familiarity, even if they have not flown this model before. One thing we like about this model is that there are pushbutton commands for the most important of movements: you can take off, land, or instantly pause your flight with one very simple touch. 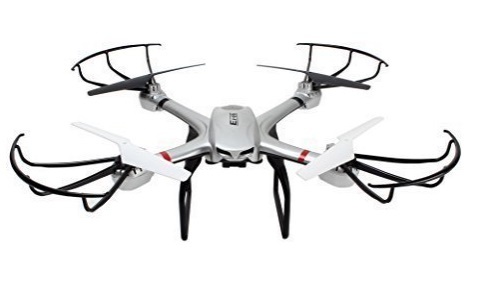 This drone is also equipped with a high-quality HDMI port directly from the controller, so you can view the current flight action from any screen you desire. The range is up to half a mile, and although there are some drone camera GoPro models that can go further, the price is definitely quite right for the 3DR Solo Quadcopter. This drone has the pretty massive claim that it is the first consumer drone with a brain, and is powered by twin 1GHz chips. This is designed specifically as a companion to the GoPre HERO series, and will be a great tool to accompany you above the water, in the canyon, or down the mountain bike trail. 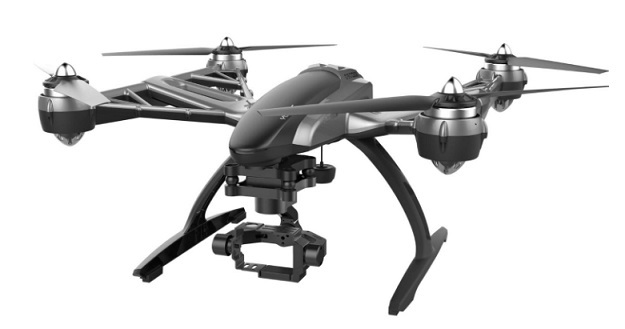 This is the popular quad from what is for the most part the world’s most well-known personal drone manufacturer. It is ready to fly, and mount fits perfectly with the GoPro Hero series of cameras. The flight time is around 28 minutes, and this is the sturdy and steadfast number that was the flagship item for the continuous upgrade up to the Phantom 4. This drone with GoPro capabilities truly became popular for it’s ease of use, and the gimbal stabilizes the camera in roll, pitch, and yaw directions, keeping the video looking smooth when sudden or jerky movements occur. As soon as you learn the ins and outs of piloting this drone, it’s a great option for a quadcopter GoPro in your collection, and is appreciated for its ease of use with the GoPro line. Here are some specs on the DJI Phantom 2, to show you a bit more in-depth what it is capable of. This is a compact best drone for GoPro that can fly high, and is also capable of flying very far. Pilots claim that the GPS-stabilized flight is one of the best aspects of this drone, and many of the same features that you’ll find within the Dji family are here. The “Circle around me” feature allows for excellent filming opportunity of action sports and beyond, and you can simply slide the GoPro camera in from the side. The remote includes a clip for your smart phone, which is where you can put to use the companion app for control and feed viewing. This is the beefed-up version of the Walkera X350, and it is a powerful drone with GoPro option that resembles the Dji Phantom line a bit in its appearance. The good news is that the battery on this one has twice the life of its predecessor, much higher landing legs, and a more durable plastic body. The pilot can enjoy features such as waypoint navigation using Google Maps, and no programming required with a very easy-to-use desktop utility that loads the software with just one click. Features such as auto takeoff and landing, return to launch, and hovering are all accomplished easily, but overall, this quad falls into the category that is not novice. To capture really great footage with this is going to take some learning, and that’s because the controls have so many advanced options for the pilot. Here are some of the vital stats on this well-versed drone, to help you make your own decision if you are itching to purchase. This is in the category of medium-sized GoPro quadcopter, and it comes equipped with a mount that is ideal for the family of GoPro cameras. Overall, this is one of the least expensive drones out there that is light, versatile, and serves many different purposes as the elements and add-ons are customizable. You have access to a customizable throttle control, headless mode, and 6-axis gyro system as well as features such as one-key return, shock absorption, and cradle ahead. Since the Ionic Stratus is relatively inexpensive, you can find some parts for it that are not made by the true manufacturer, and these you may want to stay away from. The flight time is about ten minutes, and once you pair this up with the GoPro of your choice, you’ll be in for some very smooth sailing indeed. Here are some additional specs on the Ionic Stratus Drone Quad: you can use these to see if you want to add this one to your flying collection. This is a GoPro drone in the slightly higher price range that comes loaded with quite a few nice features. It is a drone that is known for its ability to provide very stable shots while being on the go, and adventurers as well as sports enthusiasts will find in it an awesome tool to polish their photographic chops with. 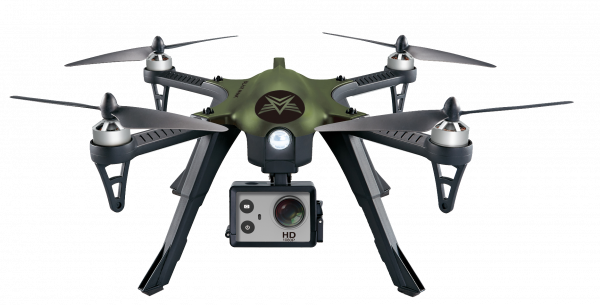 The Typhoon G comes with a warranty direct from Yuneec, and the flight time for this drone is around 20 minutes. Some reviewers have claimed that one con about this one is its video transmission range that is on the short side, but one thing they like about it is that it is pretty quiet for a quad. Some editors and experts have preferred the Dji Phantom line over this one due to its further transmission ability, but Yuneec still makes an absolutely solid product for the price. been updated in accordance with FAA standards and requirements. It can be controlled using your Android or iOS smartphone or tablet smart device using the AR FreeFlight piloting app, with 720p HD recording and live video streaming while you fly. Sharing your photos and videos straight from the app to your social media profiles is easy to do. What’s more, the new AR 2.0 firmware update eliminates the majority of the problems caused by wind conditions, sudden stops, and more. Fortunately for us all, it only costs $70, which is an incredible price when you look at the quality Parrot offers. There are a lot of choices out there when it comes to mountable cameras on drones. GoPro has come a long way since the release of the HERO5 Black, since we now have the HERO6 Black and the Fusion. One of the best things about GoPro as a brand is the fact that they are tried and true as far as the action camera community is concerned. Generally speaking, the Phantom 2 and Yuneec Typhoon are some of the top pics when it comes to this market. Knowing that the GoPro will fit easily into a drone’s gimbal that has a stellar track record is bound to make just about any pilot satisfied. We’d have to say the Xiro Explorer would be our own personal runner-up: the features on it and reports from those who have handled it confirm that it is another pretty well-rounded machine. As far as shooting with the GoPro family goes, you’re definitely going to enjoy the footage you are able to capture of downhill hijinx, rock climbing conquests, and much, much more. Take a look at our new article on Travel Drones here! I just have a doubt, since I have a gopro hero black 6, and I’m looking for a good drone with the function of follow me but not sure which is the best option for me if you could help me would be great. High quality resolution go pros that can be mounted on drones brings a lot of possibilities! Great article! Thanks, this is truly a helpful tip especially to new drone users like me.